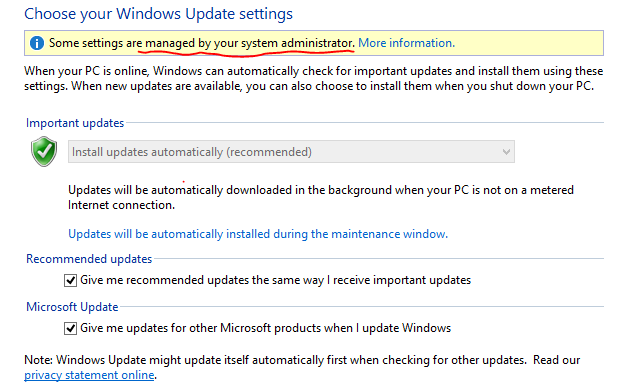 The past 8 or more years most of us have managed PC updates using WSUS (Windows Server Update Service) and Group policy. However, the structure of the modern office has changed to a large percentage of mobile employees who never ‘touch down’ at headquarters. If these devices do not connect to the domain they do not have updates applied. It is quite simple to disable WSUS management in the registry, however remember if the device is reconnected to the domain, the WSUS policies will be reapplied. Therefore you may want to move the device to an OU not linked to the WSUS policy or remove the device in the policy under security filtering. There are many articles regarding how to locate and regain space consumed by many SBS services and log files, including one of my own; “Missing SBS 2008/2011 Drive Space“. One of the most common issues is the WSUS admin logs located in C:\inetpub\logs\LogFiles\W3SVC_____ which can consume huge amounts of drive space. With SBS 2011 and SBS 2008 (2008 if updates are applied) this particular folder should be looked after by a scheduled task which clears out log files older than 100 days. In a few cases you may want to edit this and reduce it to a shorter period of time, as very nicely explained by Ronny Pot. I was asked to look at an SBS server today which had ‘lost’ most of its system partition available space. 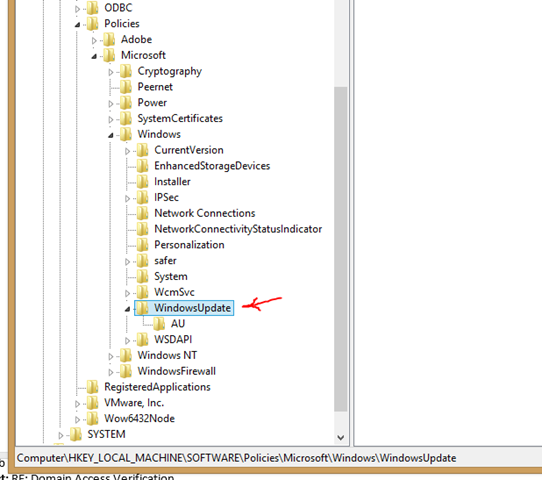 It was not really lost as it was found in a C:\inetpub\logs\LogFiles\W3SVC_____ folder. However, this should have been looked after by the aforementioned scheduled task. 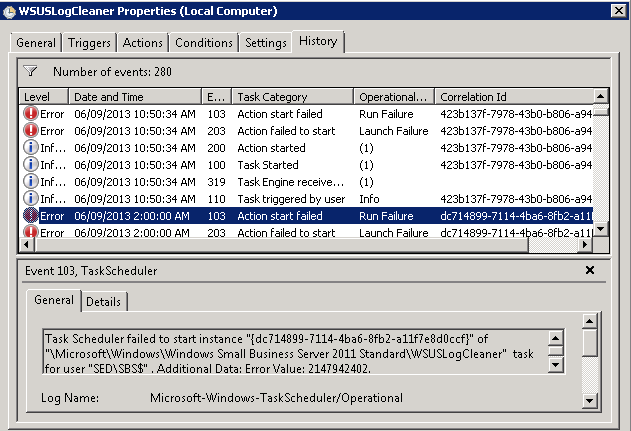 Upon review of the task history it seems the task’s script has been failing for several months resulting in “Action start failed” and “Action failed to start” messages with an Error Value of 2147942402. Note the text. If you select yes it changes the Program/Script field to C:\Program, and the Argument field to Files\Windows Small Business Server\Bin\WSUSLogCleaner.vbs 30. The entire path needs to be in the Program/Scripts field and only 30 in the argument. It seems someone in a hurry clicked yes, as one would assume when approving changes, and did not double check after the fact. 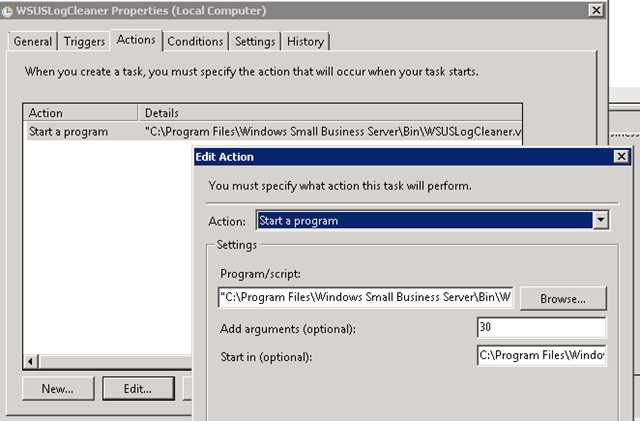 It seems the popup only occurs if there are no existing quotes around “C:\Program,Files\Windows Small Business Server\Bin\WSUSLogCleaner.vbs” in the Program/Scripts field. In my case after the reboot I was able to resolve by downloading the single update from the link below, right clicking and choosing run as administrator, and wait, and wait, and wait! Be patient, the update though small took about 45 minutes to complete but it was successful, and all services restarted. Though it did not prompt for a reboot I felt it was best to do so and everything still functioned properly. For the record, there is no mention of it in the KB article, but during the install it advises that you need volume licensing to use the update. I choose to accept the notification and continue, working on the assumption the licensing referred to the base product. In my case this was being installed on Small Business Server where Sharepoint is an integrated component. This may not be a solution in all cases, but it was a simple, though tedious, repair for this server. Google/Bing KB2720211 to locate more.